The market for HDs, as well as classic cars (60s GTOs, 442s, 57 Chevys, 60s Corvettes, etc.) is drying up as the baby boomer population ages. If you own these you might consider selling before the bubble bursts. Harley finds itself in a situation similar to Klipsch. As the market demographics contract, new sales are competing with used product. It's coincidental that an article just appeared in one of the Detroit papers regarding the success of the local Ducati dealership. The suburban Detroit store sells more Ducatis than any other USA dealership. Apparently, the demand exceeds the supply on a certain $80,000.00 model. The buyers of Ducatis are not the buyers of HDs, whether new or used. Ducati was saved when Audi came to its rescue. Like most limited production models the Duc V4 super bike was spoken for prior to hitting th showroom. Much like a Ford GT where they are gone before the rubber hits the road. And the "limited" production Duc puts HD's standard production CVO touring rigs price in the mid $40's into perspective. I remember the tariff, I don't even need to read the article. President Reagan imposed a tariff on all bikes over 700cc, so immediately every Japanese company came out with a 699cc bike and began making V-twin Harley knock-offs which before were "off-limits" by the Japanese bike makers. Wow that's a lot of recalls. Something wasn't designed right or had poor quality control. I'm surprised to find out they are opening a foreign plant. There is nothing more American than HD. The last time I remember they put foreign junk into the bikes was when AMF bought them back in the 70's and nearly bankrupted the company. HD has been using "foreign junk" on their bikes for decades...and still are. One of the biggest recalls in HD history was due to the Chinese-made bolts they were using to hold the disc brake rotors onto the wheels. Although the bolts had the proper markings on them, they were NOT what they seemed, and there were a number of incidents where riders grabbed a handful of front brake lever and the bolts holding the rotor(s) on all sheered off, and the bikes either crashed or at best did NOT stop! HD has more "foreign junk" on its bikes than American-made "junk"...and this has been going on for decades. AMF was NOT the culprit that "word-of-mouth" HD "history" has made them out to be. When AMF bought out a failing HD, there was a contract clause guaranteeing Willie G. be kept aboard as the head of design and engineering, with an additional clause guaranteeing a huge amount of money going into that R&D budget. It was after AMF took over that the bikes began to go to hell in a hand-basket with no ability to make a specific recall on a specific problem, because every bike coming off the assembly lines had different issues. It was quite obviously an "in-house" problem leading AMF to believe that the workers were purposefully sabotaging the bikes while building them. Almost all of that money put into the HD R&D by AMF was used to develop the evolution engine, but the losses that AMF was having over all the warranty repairs had them itching to get rid of HD, so Willie G. got the employees together and the banks and bought out the HD division of AMF, making it an "employee-owned" company. There has been serious speculation that this was all planned prior to the AMF buy-out of HD...get the R&D money a failing HD could not provide, then get the company back from AMF...with all its old bills paid off (by AMF) and the R&D needed for the Evo twin and the new "retro" line of bikes..with springer front ends and such....to include the appearance of a hard-tail "look" that was actually a pretty-much-hidden soft-tail rear end suspension...with the suspension mounted UNDER the frame more-or-less out of sight. Did AMF/Harley employees sabotage the bikes while AMF owned the company?? Your call! Was all of this planned PRIOR to the AMF purchase of HD? Your call, again! Me? 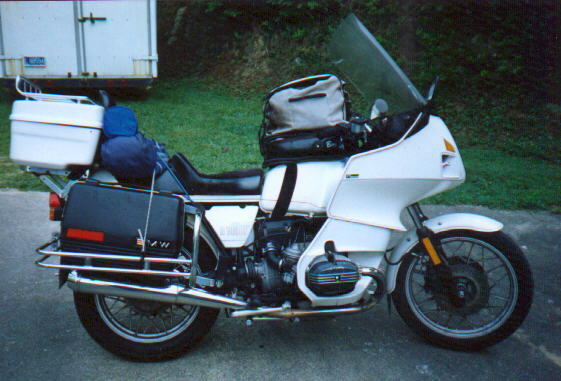 It doesn't matter either way...I ride a 1983 60th Anniversary Edition BMW R100RT, one of about 250 made! Fast, comfortable, reliable, easy to maintain...plus it ALWAYS GETS ME TO WHERE I AM GOING! Every American made motorcycle and automobile manufacturer uses foreign parts in their products, not sure if the percentage anymore but it used to be listed on the window invoice. Nice bike HDBR. Fairing looks a slight mod from the R100RS. Still today probably the Best foul weather fairing ever. I just passed up an '83 RS which I should have grabbed. While the R90S was a landmark bike in my eyes the 100RS was the bike to have although the 90S are holding value quite well. Thanks! My bike also has the 3" taller than stock National Cycle lexan windshield, the Reynolds pull-out luggage rack, Luftmeister trunk, luggage guards, brown sidestand, Reynolds "roll-off" center-stand, etc....all popular accessories from its days. R100RT and R100RS share everything except the fairing upper, to include the RS engine...from 1979 (year the RT was introduced) thru 1984, anyway. When they "came back out" (due to consumer demand) with the R100 bikes later on, the engines on all of them were basically the R80 engine, with bigger "jugs"...no more 40mm carbs, no more dual exhaust header crossovers, no more large intake and exhaust valves...but just the 32mm carbs, etc just like on the R80 engine. Trust me, you can definitely tell the difference in performance between the two different versions of the R100RS engines...early and later versions! I prefer the old airheads, simply because I know all about maintaining them, which is pretty easy to do. I do NOT run fork oil in my front end...I use Texaco #15 aviation hydraulic fluid, which is MUCH cheaper than fork oil, totally eliminates any stiction possibilities, and has to be replaced much less often. When BMW came out with the "BLUE" fork seals it made using aviation hydraulic fluid possible because the blue seals are dual wiper seals, unlike the original black rubber single-wiper seals You can take a clean metal gallon fuel can to almost any airport that does aviation maintenance on any aircraft and pick up a gallon of it for a buck or two...enough to last a few years. I also run Progressive fork springs, and Progressive rear shocks and springs. It is like piloting a Cadillac...just floating along with a smile on my face! Yes, I know. I've had several, now the K1600. You really have no idea how good front end can until you ride one with Duolever. A variation of the old Hossack deign. It is so superior to traditional forks that's its hard to describe. I don't know if it's still true, but I heard 5-10 years ago that Toyota used more American parts than most of the American companies. An in-tune BMW airhead twin sounds like a PERFECTLY BALANCED engine design SHOULD SOUND! Actually, when riding, you just hear the valve train...tikka, tikka, tikka...like a Singer sewing machine...it does NOT sound that way, then you DEFINITELY need a valve adjustment ASAP! When my bike starts getting LESS THAN 45-47 mpg on the highway, then it is time for a valve adjustment...I only re-torque the heads about every third or fourth valve adjustment. It takes about 15-20 minutes max on a cold engine to do it all, once you start the job...unless you are lollygagging around or trying to teach somebody how to do their own work. BMW airheads with aluminum alloy nickasil-coated cylinder bores don't have a base gasket, they have an O-ring, instead! At high rpm, like a F1 car. Engine was designed by Ricardo Engineering, check their credentials. No, it ain't potato, potato popper. Although with the right deep throated exhaust an HD sounds bad asss. The sound HD riders love so much is due to a less than 90 degree V-twin engine with both of its connecting rod crank ends sharing just ONE crank pin, "knife and fork" style...NOT A BALANCED ENGINE DESIGN at all! I've owned a few HD bikes over the years...had an early pan-head, and a shovelhead...did my own work on them...lots more work required than on my BMW! I have always done my own work on bikes, except for my 750SS Duc that I had in Italy in the early 70's...I just dropped it off at the shop and let them take care of it whenever I was about to go to another NATO country for training for a month or so...picked it up when I got back. They always complained when I picked it up...and tried to get me to sell it back to them...because it steadily went up in value and was much quicker than the 900SS that came out a couple years or so after the introduction of the 750SS. That particular 750SS Duc Imola model is worth a fortune nowadays! It was a TRUE "RR" (race replica) bike years before they even coined that term for racing bikes in street-legal garb! I bought one of the tariff buster 699cc bikes from Honda. It had 83hp instead of the 60 hp the 750 version had the year before - it was an 86 model so tariff would have been 1985. Compared to the bike a year before the new 699cc version was far superior in looks, weight, and performance. It had an 11K redline. I am a V8 person but when it comes to bikes I like inline 4's unless we talk about the CBX. Always liked the HD's but the performance and price were a problem for me. I do buy american but broke with that for performance which HD did not have in the 80's. P.S. Got hit by a car a few years ago, got new hip to prove it, so gave up riding until children are out of college. That wouldn't surprise me. Did you know there is an NGK spark plug plant in West Virginia? One of the best cars I ever owned came from Marysville (near Columbus) Ohio, a 1986 Honda Accord. It had a super reliable American-made 4-speed Borg-Warner automatic transmission. I don't know if they still make them, but Ford used to use the 351-C and 351-W engines, made in Cleveland and Windsor, Canada. Not everyone knew their American car had a Canadian engine, but they used different parts. The Cleveland being the performance engine and the Windsor being the truck engine. With a stronger block design for trucks the Windsor is capable of more power. It is easy to stroke the Windsor to 427 CI today. The last bike I drove was a 650 Bonneville in the 70s. The acceleration and sound were addictive, but I kicked the habit. I can’t imagine riding a bike in traffic today. It was bad enough not being seen by motorists in the days before cell phones. The balance and cooling provided by BMW flat twins always intrigued me. Nonetheless, I scares me to think of one of those cylinder heads coming into contact with pavement. Sold my bike seven years ago because playing in traffic just got too crazy. It's reached the point where I'm frightened by other drivers when I'm in my 2-ton SUV -- on a bike it's just terrifying. People play chicken with other peoples' lives like they're in a video game. Except in real life, when you get to "Game Over", it really is. Your feet would be ground off to above the ankle before that could happen without you going down...apparently you have never ridden one...don't believe in that particular old wive's tale...it simply isn't gonna happen while riding, unless you go down for some odd reason...and then it saves your leg on that side! I have seen the damage done when a BMW twin goes down on its side, and the worst case scenario is replacing a cylinder head and valve cover...best case scenario is a scratched-up valve cover and re-torqueing the heads and adjusting the valves on that side and riding it home. You will most often find that BMW flat-twin riders have been riding for many years prior to purchasing one. And once they get one, they tend to stick with them.